Truss Supports: (2) No.1 YP 2×10 Headers – Hurricane Tie Straps. Roofing & Siding: Steel Roofing & Siding. 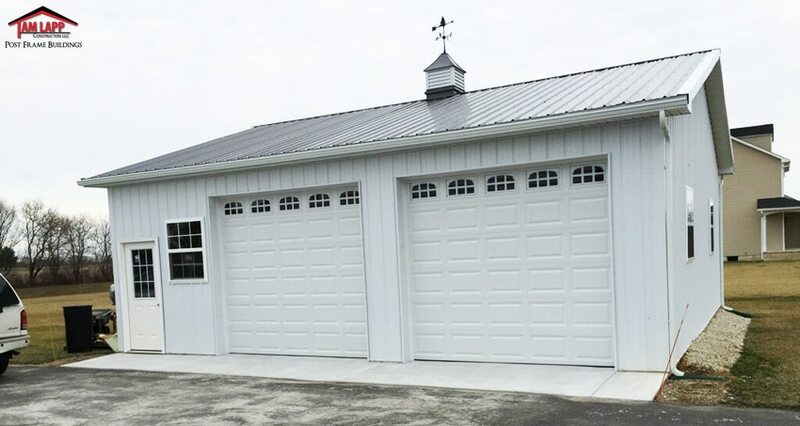 Clopay Garage Doors: (2) 10’Wx9’H with Colonial Inserts. Floor: 4” 4000 PSI Smooth Finish Concrete Floor w/Fiber-Mesh; Control Joints & 4” stone base Included w/ 2’Wx32’L Concrete Apron @ Garage Doors. Cupolas: (1) 24″ Cupola w/ Sailboat Weather-Vane. Colors: Charcoal Roof – Brite White Siding & Trim.